The road diet is over! A $13.5 million revamp of Range Line Road opened right on schedule in time for CarmelFest – Carmel, Indiana’s two-day July Fourth celebration held on July 3 and 4. American Structurepoint provided construction management for the project that brought a boulevard-type feel to Range Line Road, one of the most important roadways in Carmel. The road diet reduced Range Line Road from 5 lanes to 2 lanes from 116th Street to Fourth Street. 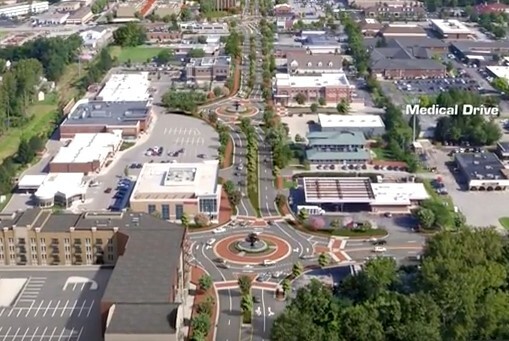 Our road engineers also designed roundabouts for three of the six intersections getting makeovers, and we designed the streetscape for the entire project that included a landscaped median, multi-use path, bicycle track, widening sidewalks, and making the road much more pedestrian friendly. Our Construction Solutions Group also provided construction inspection services for the entire project. Way to go everyone!